Egg Head | Barbie Who? As none-of-you probably know, I live near a military base. I occasionally go to the thrift store on base, and it my favorite place to find dolls for this project. I like their dolls because they tend to be more recent and don’t have a price written in Sharpie on them. I found two Rapunzel dolls (from the movie Tangled) and several others that I suspect are Disney princesses while shopping at that store. I’ve even found some cool doll clothes, including the outfit Barbie wore in Toy Story 3. It is a fantastic little shop! I went there earlier today because I was running errands and they were open (they have crazy rotating hours and always seem to be closed when I’m on base). I was looking through a bin of Happy Meal toys when I found something I can use! 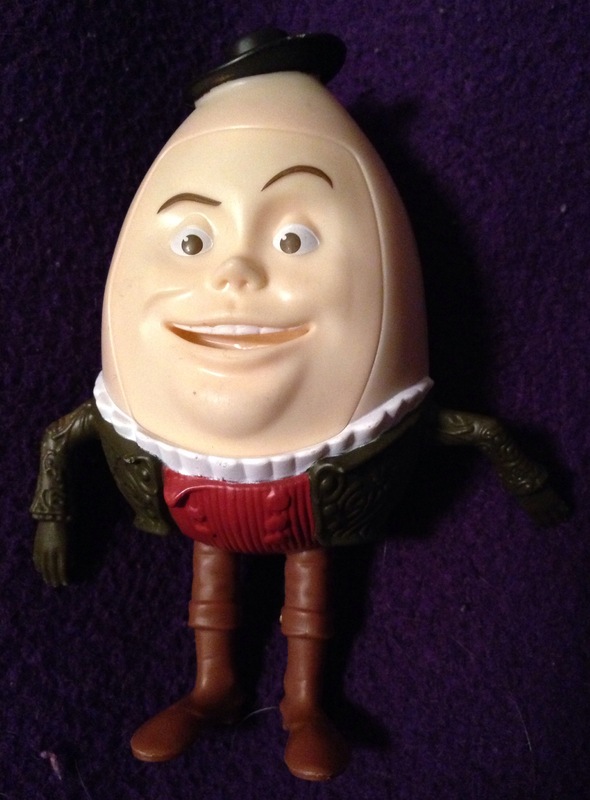 It is a toy fairy tale egg, probably from one of those Shrek movies. I plan on using his head to create a Sontaran. This almost makes me wish I hadn’t passed up that headless Ken doll I saw at GoodWill last week….. Almost. As you know, Sontarans are a race of bloodthirsty aliens. They have appeared on Doctor Who off and on since the 70’s. I enjoyed their appearance alongside Donna, Martha, and the 10th Doctor in episodes “The Sontaran Stratagem” and “The Poison Sky”. In those episodes, the Sontarans are trying to turn Earth into a clone world. Needless to say, the doctor and his companions pulled through and life on our planet carried on. To recreate these beasts, I can either cut up the figure I purchased and use it for the head, or I can use the head as a guide to create something out of clay. Making a clay head would be more ambitious, but I am not the greatest at making things look sharp with polymer clay. Still, if I go the clay route I could easily make more than one head – perhaps having different expressions on each one. It is up in the air, for now. I will make a more definitive decision when I get around to making one. I can promise one thing, though: the first doll will certainly not be a Sontaran. I have something special planned for the first addition to Barbie Who?